This White-on-white Christmas card is made using a digi stamp from Heather Ellis. Made into a square topper, matted on gold, it has been mounted onto glittery vellum to make a 6 x 6 CAS card. Today’s card uses a digistamp from and is called Chirps arrival. I used no papers his week but typeset a bible verse to compliment the image. There are some lovely DT cards over at Creative Moments and you can use the link to enter your card for the spring challenge. This is the last Creative Moments challenge this year and I have a beautiful digi from Bugaboo. She is coloured using Promarkers and layered using Papers from Hunkydory. He is usually known for darker and more Gothic images and this digi could be coloured that way too, Ihave gone cute though! There is more pink inspiration on Creative Moments and you can enter the challenge there to win digistamps from Rick. The backing paper is from Hunkydory and the sentiment is made using a Die-ire die. This card is also made using Forever Friends decoupage. It was made for a dear friend and his wife and their new daughter, Grace. The new challenge, starting today at Creative Moments, is add some bling. 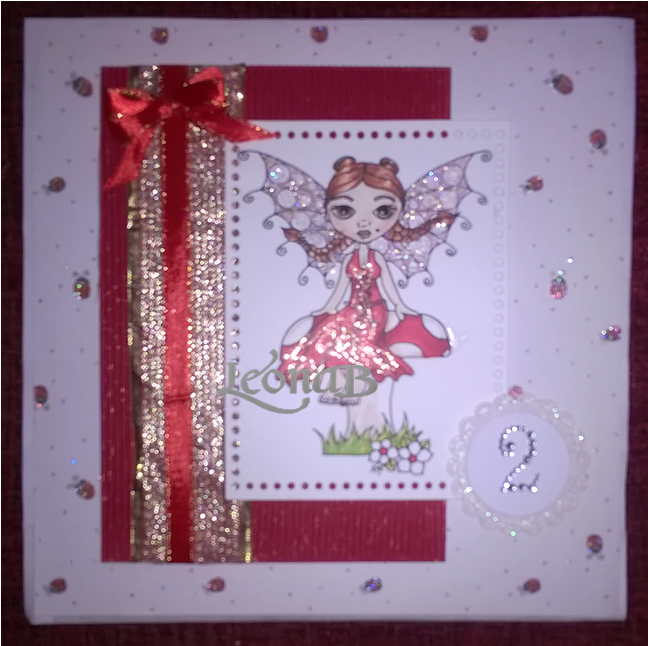 I have made an 8 x 8 card, which is super sparkly for the add some bling challenge.